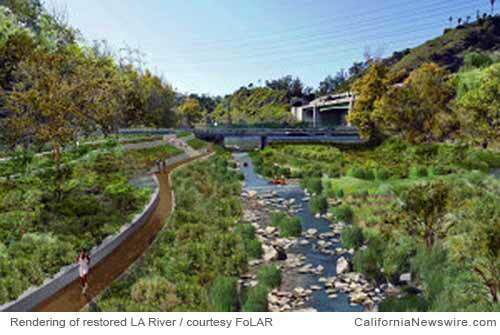 LOS ANGELES, Calif. /California Newswire/ — Friends of the Los Angeles River (FOLAR) will celebrate 30 years of advocacy on the L.A. River with a gala at L.A. River Studios in Cypress Park on Oct. 8, 2016 from 7:30 -11:30 p.m. Music industry tastemaker and veteran radio personality Nic Harcourt from KCSN 88.5 FM will host the evening’s festivities. On tap are events which include musical performances by singer-songwriter Mia Doi Todd, The Jason McGee Gospel Choir, DJ set by Kita Klane, Soul Band Zach Alwin & Duck Funk and a very special surprise musical guest who is a true visionary and friend of the L.A. River. “We’ve had a lot of artists come down to the River over the years but nothing beats what you’re going to see at this Fandango. River people will talk about this one for years” said FoLAR President and Founder Lewis MacAdams. The musical performances are matched by the talent of four renowned Los Angeles-based artists that will be exhibiting works at Fandango. Christian Kasperkovitz, AKA ELKPEN will create a chalk art installation, Ryan Patrick Griffin will be showing a projection piece inspired by the L.A. River. The gallery at LA River Studios will serve as a showplace for the work of photographers Peter Bennett and Grove Pashley, who both have a long-standing relationship with FoLAR. Friends of the Los Angeles River will unveil The Lewis P. MacAdams River Champion Award, created to acknowledge thirty members of the community and organizations that have supported their thirty years of L.A. River advocacy and revitalization. The honorees have been chosen to represent the passionate and diverse community that has made river restoration a major priority in Los Angeles. Fandango takes place at LA River Studios not far from where Lewis MacAdams first picked up the bolt cutters and started the LA River movement in the Elysian Valley. In the spirit of honoring Los Angeles makers, movers and shakers, Fandango features various brands and services that have donated their time and goods to the event including Starry Kitchen, Heirloom LA, Village Pizzeria, Jeni’s Splendid Ice Cream, Maltose Falcons, Deep Eddy Vodka, Angel City Brewery and a special light installation by Light Riders.